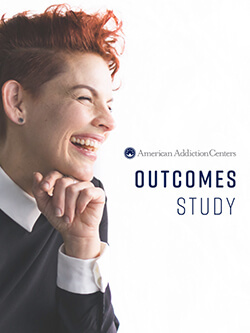 American Addiction Centers (AAC) is breaking new ground in addiction treatment with the release of its first patient outcomes study. AAC is joining the ranks of only a handful of national treatment centers to measure outcomes and publicly share the findings. Utilizing three years of tracking and research, with the assistance of Centerstone Research Institute (CRI), the study analyzed how treatment at AAC facilities impacted the lives of patients. -Michael Cartwright, CEO, American Addiction Centers. Addiction and addiction treatment are extremely complex. Both the causes and results of addiction affect many areas of a person’s life, including job performance, family and social relationships, and mental and emotional well-being. The process of addiction recovery is similarly multifaceted and expands far beyond abstinence versus relapse. American Addiction Centers (AAC) approaches treatment and recovery from a holistic perspective, supporting patients to build the quality of life they want in all domains, including physical health, mental and emotional health, family and social systems, and vocational functioning. Aligned with best practices as well as what is known about best programming and optimal outcomes, treatment at AAC—which includes a combination of therapies and other support services—varies depending on the type of addiction and characteristics of each patient seeking treatment. In consideration of this broader view of recovery and a dedication to delivering patient-centered, effective treatment, AAC hired a third-party independent non-profit research organization, Centerstone Research Institute (CRI), to build a patient outcomes monitoring system that supported the systematic collection of patient outcomes data at intake, discharge, and post-discharge. This patient outcomes monitoring system was embedded within the electronic health record and integrated into the clinical workflows for staff who interface with AAC patients day-to-day. The function of this system was to standardize data collection across AAC’s multiple facilities to permit comparison, process improvement, and collect long term data about patients’ experiences post discharge over a three-year study period. The primary goal of this study was to assess the immediate impact of AAC’s treatment program on substance use, family functioning, mental health, physical health and other key outcomes. Over a three year period, more than 4,000 people enrolled in the study. Upon entry to an AAC facility, patients were experiencing significant impairment in many life domains. Forty-eight (48%) percent of patients reported alcohol use as a problem at intake, and 49% reported heroin or prescription opiates. Smaller numbers reported use of cocaine, cannabis, amphetamines, and sedatives. Sixty-seven percent (67%) reported using multiple substances during the month prior to admission. In addition to substance use disorder, most patients reported significant mental health problems (depression, anxiety, or trauma) and family conflict at admission to treatment. AAC outcomes data clearly indicate that patients entering treatment report a significant level of depression (admission PHQ-9 score of 11.53, which is considered moderate). At discharge, PHQ-9 scores drop on average to 2.43, which is considered minimal or no depression. One of the most important predictors of long-term success is based on a concept called Recovery Capital, which is a way of assessing improvements in a patient’s recovery support resources, their identity in recovery, recovery environment, and access to medical and financial resources. Outcomes assessments also indicated a substantial reduction in relapse risk. Addiction treatment is about more than just quitting drugs and alcohol, it is about a new approach to living with the chronic disease of addiction, and family involvement and support is critical to long-term success. Outcomes scores on the Family Assessment Device (FAD) and Addiction Severity Index (ASI) indicate significant improvements in family functioning with 30 days or more of treatment. Among the entire study population, patients who received treatment at AAC experienced statistically significant improvements in all of the functional domains assessed from intake to twelve months post discharge. Over half of the patients reported abstinence in the previous 30 days, with 69% reporting abstinence at the two month follow up and 57% reporting abstinence at the twelve month follow up. From intake to the twelve month follow up, patients experienced significant decreases in the number of days using substances in the past 30 days: an 83% decrease for alcohol use, 90% decrease in days using heroin, and a 94% decrease in days using other opiates. At the twelve month follow up, there were significant decreases in the number of patients reporting mental health symptoms in the past 30 days, including a 93% drop in serious depression and a 52% drop in serious anxiety. There was also a 94% drop in patients reporting suicidal thoughts and a 100% decrease in suicide attempts, both in the past 30 days. 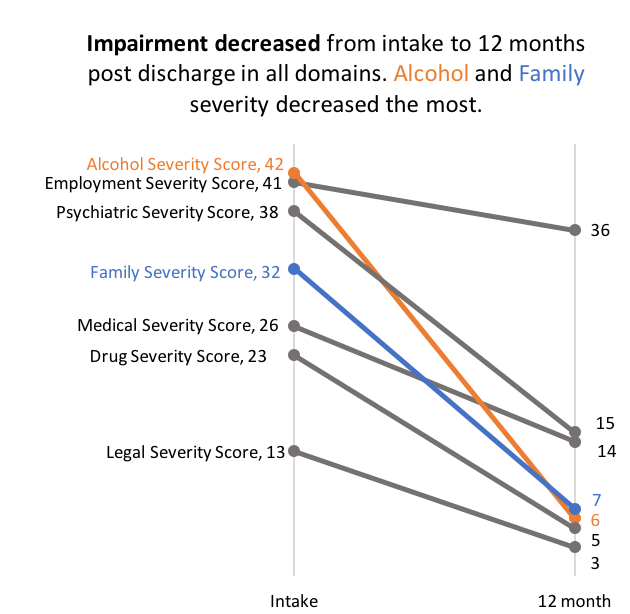 In addition to these substantial and sustained improvements in substance use, AAC patients improved their physical health, employment status, legal status, family relationships, and mental health, as measured by the Addiction Severity Index Composite Scores. Higher composite scores denote higher severity or impairment. 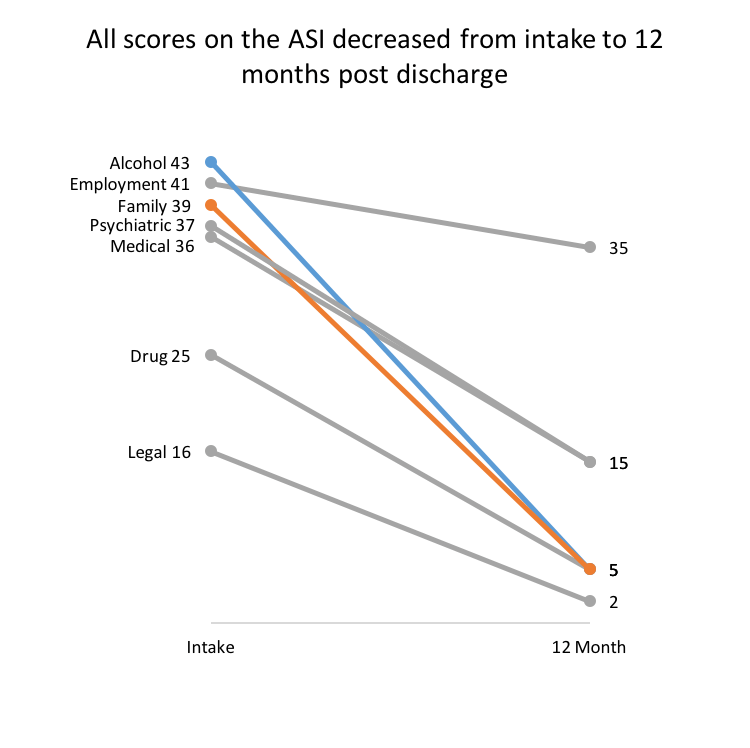 The composite scores that improved the most from intake to the twelve month post discharge follow up were Alcohol Severity, which dropped 86%, and Drug Severity and Family Severity, which each dropped 78%. All of these decreases in severity were statistically significant, demonstrating that the benefits of AAC treatment are sustained a year after treatment. The final White Paper reports findings from a stratified random subsample of patients at the longest follow up period, 12 months. Although the sample size in White Paper #3 is comparatively smaller, this sampling methodology is the most statistically valid approach to understanding true patient outcomes across a large population and reduces possible bias in results from a large scale total population sample such as the one described in White Paper #2 above. The good news is that the results of the larger total population sample and the smaller stratified random sample reveal a similar pattern of outcomes, supporting the the overall validity of the research findings. Because the 12-month subsample represents a stronger research methodology, those are the results used for general reporting of outcomes. That said, all White Papers are provided. The Addiction Severity Index (ASI) measures the severity of client’s unmet needs in each domain, on a scale of 0 to 100 1 . These scores are referred to as Composite Scores and have been validated as measures for change in severity over time. The average Composite Scores decreased from intake to 12 month follow up in all domains, reflecting improvement in that status of client’s lives in each domain. The most dramatic decreases in severity were in the Alcohol domain, dropping from 43 to 5, followed by the Family domain, dropping from 39 to 5. The smallest decrease was in Employment. These decreases were statistically significant. ASI composite scores range from 0 to 1. For ease of interpretation, all scores were multiplied by 100 to transform them into whole numbers. At the 12 month follow up, 48% (n=39) of clients reported that they had not abused any substances since leaving treatment, meaning that they had no slips or relapses since leaving AAC. Sixty-three percent (n=51) of clients had not used any substances in the past 30 days. Of the clients who reported that they had been using in the past 30 days, the majority reduced their use as compared to their patterns at intake. Specifically, clients were asked how many days in the past 30 they used each substance. Among those who reported use in the 30 days prior to intake, the average number of days using each substance decreased from intake to twelve month. For those reporting any alcohol use at intake, the average number of days decreased from 15 to 3 days at the 12 month follow up. For those reporting any heroin or other opiate use at intake, the average number of days reduced from 24 days to 3 days and from 21 days to 1 day respectively. 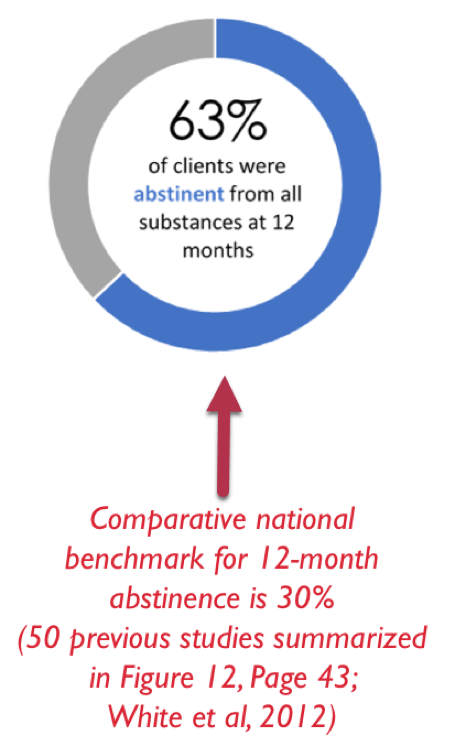 Clients who reported they had used a substance in the 30 days prior to the twelve month follow up also saw a significant decrease in the average number of days of use, indicating harm reduction. Three-quarters of the sample (75%, n=61) reported alcohol use in the 30 days prior to intake. At the twelve month follow up, only 26% (n=21) of the sample reported any alcohol use in the prior 30 days, representing a decrease of more than half. The average number of problem days decreased by 91%, from 12 days at intake to 1 day at the twelve month follow up. Clients were asked to rate how troubled or bothered they were by the alcohol problems they experienced in the previous 30 days, and over half of the sample (54%, n=44) reported that they were less troubled or bothered at the follow up as compared to their response at intake. An additional 40% (n=33) of clients reported that they were not at all bothered by alcohol problems at either the intake or follow up time point. Finally, the average amount of money clients spent on alcohol in the past 30 days decreased by 84% from intake to the follow up, from $140 to $22. Similar to the reduction in alcohol use, the proportion of clients who reported any drug use in the prior 30 days decreased from 74% (n=60) at intake to 26% (n=21) at the twelve month follow up. The average number of days clients’ experienced drug related problems dropped 86%, from 14 days to 2 days. Fifty seven percent (n=46) of the clients reported a reduction in how troubled or bothered they were by drug related problems at the twelve month follow up, and an additional 35% (n=29) reported they were not at all bothered by any drug related problems at either intake or the follow up. The average amount of money spent on drugs in the prior 30 days decreased by 87%, from $700 at intake to $91 at the follow up. Very few clients reported hospitalizations for physical health reasons. Nine clients (11%) reported one hospitalization for physical health reasons in the 30 days prior to admission, and only 3 clients (5%) reported one hospitalization in the 30 days prior to the twelve month interview. At the 12 month follow up, clients were asked if they had gone to the emergency room for any reason in the previous 30 days. Only 4 clients reported they went to the emergency room in the past 30 days, all for physical health reasons. The average number of days that clients experienced physical medical problems decreased from 9 at intake to 5 at the follow up. Forty-four percent (n=36) reported that they were less troubled or bothered by medical problems at the follow up, and 30% (n=24) reported they were not at all bothered by medical problems. AAC provides treatment for co-occurring substance use and mental health disorders. At intake, 31% of the sample (n=25) reported that they had been treated in an inpatient or hospital setting for psychiatric needs at least one time in their lives. 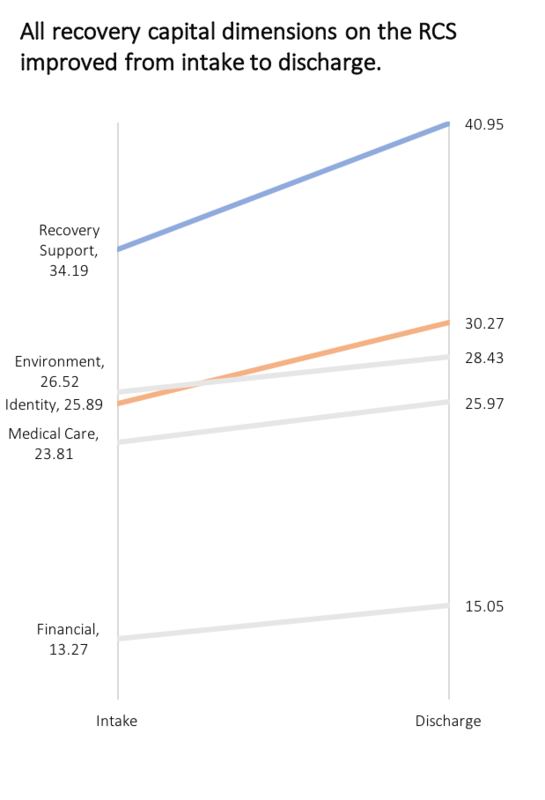 A slightly higher proportion of clients reported that they had received outpatient treatment for psychiatric needs at least one time in their lives (43%, n=35). All clients regardless of psychiatric history were asked at intake and the twelve month follow up if they had experienced any of a series of mental health symptoms in the previous 30 days. The most commonly reported symptoms were serious anxiety and serious depression. 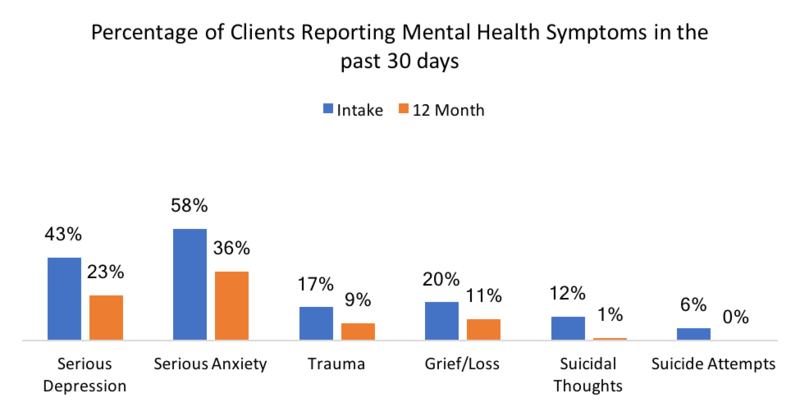 At the 12 month follow up, the proportions of clients experiencing each mental health symptoms dropped. Clients were then asked how many days in the past 30 they experienced any of the mental health symptoms they reported. The average number of days decreased from 16 days at intake to 7 days at the follow up. Nearly three-quarters (72%, n=58) of the clients reported that they were less troubled or bothered by these problems at the follow up. Only 11% (n=9) of clients reported they were not at all bothered by mental health symptoms at intake and at the follow up. Only one client reported a hospitalization due to emotional or mental health reasons at the 12 month follow up. Family members have a critical role to play in clients’ recovery. As part of AAC’s program, family members are contacted as early on and invited to participate in family therapy with the client, in addition to the client’s individual therapy which often addresses family dynamics. Clients were asked about their relationships with family members as well as friends, co-workers, and other social connections. Clients reported improvement in both their relationships with family members and other social relationships from intake to follow up. Specifically, the average number of days of serious conflict with family members decreased from 7.8 days at intake to .5 days at the follow up, and the number of days of serious conflicts with others outside of the family decreased from 3.4 days to 1 day. Over half reported that they were less troubled or bothered by problems related to their family relationships (74%, n=60), and just under half reported this reduction for other social relationships (47%, n=38). A small proportion of clients reported that they were not at all bothered by family problems at either intake or follow up (20%, n=16), and a much larger proportion were not at all bothered by social relationships at either intake or follow up (44%, n=36). American Addiction Centers facilities are accredited by either the Joint Commission (TJC) or the Commission on Accreditation of Rehabilitation Facilities (CARF), and their techniques and intervention strategies are rooted in scientific research. The company believes that recovery is possible for anyone, that hope is key, and that providing individuals with tools to help them remain clean and sober for life is a primary aim of American Addiction Centers treatment. This strong belief in the philosophy and approach to treatment lead AAC to hire a third-party independent evaluation team in 2015. Evaluators were asked to measure outcomes among clients entering AAC for residential treatment, at discharge from treatment, and at 2, 6 and 12 month post-discharge intervals. The evaluation was specifically designed to measure critical health and social functioning outcomes that are typically the major reasons for relapse to substance use following treatment (e.g., alcohol use, drug use, mental health symptomatology, lack of family/community recovery support, etc). Valid and reliable instruments were selected to measure each of these areas of functioning and were collected as a routine part of intake and discharge information gathering. The evaluation team established a call center solely dedicated to tracking and interviewing clients after discharge from treatment so that these same outcomes could be measured over time. White Paper #3 represents a sub-study of a larger three-year evaluation. The results demonstrate that randomly selected clients who completed AAC treatment experience positive outcomes in all of the key functional domains assessed and that these improvements are maintained twelve months post discharge. There were significant reductions in alcohol and drug use, and over half of the clients had not used any substances in the 30 days prior to the follow up interview. Among those who were using, the average number of days reduced, as well as the extent to which the client was impacted by alcohol or drug problems as compared to intake. Additionally, clients reported a reduction in mental health symptoms, including depression, anxiety, and trauma. There was a large reduction in suicidal thoughts and suicide attempts from intake to follow up as well. While relatively few clients reported physical medical issues at intake, there were very few hospitalizations, emergency room visits, and a low average number of physical health problem days at follow up. The former CEO of CRI became an AAC employee in 2016, while the study was being conducted. During his tenure as CEO, he was aware of the initiative, but was not directly involved in the collection, analysis, or reporting of any AAC data. As with any study using self-reported data, there is a risk of respondent bias. This respondent bias has been accounted for in the analysis.